A Modular Home, also called a Prefab Home and officially known in California as “Factory Built Housing”, is built in a factory to the same state and local building codes as homes built on- site. 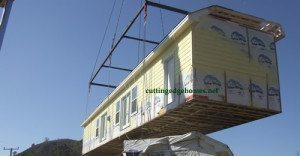 The home is then carried in sections on special trucks to the building site where a licensed specialty “set crew” using a crane or sophisticated rolling equipment places it on a regular concrete foundation, and a licensed contractor completes the home. Once we deliver the home, it is finished according to the California Building Code and with architectural details so that it looks like and is the same as a “traditional” stick-built home. Find more modular construction information here. Our standard modular homes retail for a minimum of about $150.00 Per Square Foot (“PSF”) delivered including sales tax. Modular homes generally cost 5% to 20% less than a comparable finished home built on-site in most areas of California, but we think that the biggest benefit is in faster building and a modular being a better method of construction. As a home gets larger the cost PSF gets lower. The cost PSF will increase incrementally when homes get smaller as the construction cost-efficiency is reduced relative to the home size. While our modular homes are normally less expensive than site-built homes, the homes will not be as cheap as a manufactured or mobile homes, as our quality standards are much higher and the cost is more. We typically tell our clients that if they can’t afford a minimum of $185.00-$195.00 per square foot for their vertical construction costs (hard costs from the foundation up on a level lot), they probably cannot afford our more value-conscious modular homes. Because there are no differences in the appraisal guidelines or a required disclosure, there is no good reason that a modular home has to be less expensive than a site-built home. For our Cape Cod homes we upgrade the roof to a steeper pitch and use a different roof truss to create the open attic area. This can be built out as livable space on-site, and we hope to offer the option of the second story being built in the factory in the near future. Cape Cod homes are some of the best values that we offer at Cutting Edge Homes. If you would like to find out more about the pricing for a specific plan please sign up for more information on our Contact Us form and we will provide the pricing information to you directly. How can I save money and get my home built faster? Pick a Stock Plan that is in our CAD / computer drawing system and you will get a cash discount. Stock Plans can be engineered for your site faster than a new custom plan. Selecting from these plans is one of the few ways you can simplify the building process, and we pass on the savings to you. Building with Cutting Edge is already easier than your other choices but building in California can be complicated. We encourage our clients to consider ways to make it easier, faster, and more economical. 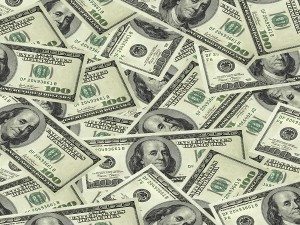 Using a plan where someone has already put in the money, time, and effort to get it drawn up will simplify the process and have you living inside of your new home much more quickly… with a few extra thousand dollars in your pocket. These specials apply to modular homes built in California only. Do you sell real homes; or do you sell trailers or mobile/manufactured homes? We just sell real homes. All of our homes are built to the State of California residential building codes. We don’t sell any mobile homes or manufactured homes, so please don’t worry! We are using an advanced way of building homes, not building trailers. These are regular homes built in components in the factory and assembled on-site, but become indistinguishable from conventionally-built homes when completed. The financing is the same type of construction or permanent financing that you get with any other home. And your home will appraise like a similar stick-built home on a similar lot with similar amenities. Don’t take just our word for it. The Federal National Mortgage Association (FNMA), or “Fannie Mae,” provides liquidity, stability and affordability to the mortgage market. Its purpose is to create a secondary market for the purchase and sale of mortgages, so it is the most credible source that you can go to about the sale and financing of modular homes. Please see the Fannie Mae “Selling Guide: Factory-Built Housing: Modular, Prefabricated, Panelized, or Sectional Housing” here. Read a technical comparison between modular and manufactured homes here. It is generally not possible to close a construction loan without first spending considerable time, resources, and effort on your project. This is based upon the lengthy timelines for a building project, likely permitting delays, and the uniqueness of each project. A construction project typically requires that you at least have already purchased the land, paid to prepare engineered plans specific to your project, have submitted to the local jurisdiction and obtained planning approval and building permits. When those items are completed, your project costing can be finalized by the General Contractor (others). The lender will then review your application for outstanding items so you can close your construction loan. We understand not all clients are familiar with or excited about the time and investment required to build a new home in California. We like to prepare our clients for reality and do not want to sugar-coat this process as it can be trying even for a sturdy person. Important Note: Our pricing lists provide model specific prices for cash buyers of our homes. Additional short term financing costs will apply when a lender’s payment schedule differs from the factory’s. Once I have my lot and financing, how long does it take to build a modular home? Building a modular home will take approximately half of the construction time of conventional construction. Because the modular home is built in the factory concurrently with the grading and construction of the foundation the overall construction schedule is sped up tremendously. We service the entire state of California as a supplier of modular homes. If Cutting Edge builds all over California how can you serve me in my community? We are confident that we can compete with any local retailer of modular homes on price, and our services are more thorough and customized than our other state-wide competition in California. As they say down south, we didn’t just fall off the turnip truck. We have been doing this for twelve years and we have a complete project system in place. Most of the work that we do is done by email, telephone, and fax, so location is not that important except when we do our initial route survey at your lot and when we deliver the home. We work with local general contractors that manage your project on-site who will be close and handling the critical on-site issues. In areas that we do not have an available general contractor, we will find, train, and work with a new local contractor to do the on-site work. Our fourteen years of experience building in California’s difficult building code and legal environment is proof that we will stand by our clients from the start-to-finish of their projects. We didn’t copy anyone else’s way of serving clients – we designed it from the ground up for our clients in California based on the challenges that they face living and working here. Our first home was built as our founder’s family home, and we take building homes for families in California seriously. We work under an “Open-Source” philosophy painted with a healthy dose of realistic thinking, providing free, fair, and as complete of information as we have available. We work hard every moment to ensure that our client gets the best home and skilled work at the lowest possible price. We fully disclose all the information we have about ourselves, the industry, the laws and regulations, and our competition because we are confident you will choose us when you have all of the facts. What is your experience and certification to be selling these homes? Cutting Edge Homes Inc. was founded in California in 2004 when our principals were looking for a more affordable way to build residential homes. After several years previous years of developing for sale projects we wanted to speed up the construction process and reduce unknowns without sacrificing quality. We began as one of several companies focused on the regional distribution of modular homes throughout California, with a focus on the more custom buyer. 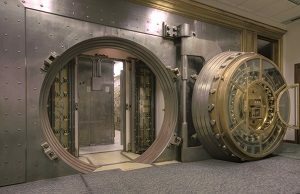 To our knowledge, we are the only one of those companies that survived the economic downturn and we are thriving today. We have a market coverage area from the Mexican border to Oregon, and from the Pacific to the Sierra Nevada Mountains. We have built houses with Border Patrol helicopters flying over constantly in eastern San Diego County, and others in a Redwood Forest that was closer to Oregon than the next town south in California. In 2012 we completed an ocean front villa in Marin County facing Point Reyes Peninsula, a Silicon Valley infill project, a Cape Cod style cottage on a Napa Valley vineyard, a ranch home on an Almond farm in the Central Valley, and a multi-unit development by the beach in Santa Cruz (among other projects). In 2014 we delivered two complete homes and assembled them in seven (7) days in the parking lot in front of the International Builders’ Show in Las Vegas, Nevada as the center-piece of the Show Village. We have permitted and built many homes in the strict California Coastal Commission zone, and we are a preferred distributor for the State of California based on our performance on public works projects in the fire-rebuild zones. We have sold homes from many of the available production facilities in California and have played a large part in the growth of the modular home industry in California over the last decade. We enjoy a challenge and like to get involved in complicated projects that require a lot of planning, but our passion is delivering economical and simple construction solutions that help real people living in the real economy get into their dream home with minimal headaches and without breaking their budget. Our staff members hold a certification from the Modular Housing Training Institute, an industry training and certification program that sets a best-practice benchmark for the building and setting of modular homes. We understand the market and have licensed loan brokers, real estate agents, appraisers, and a Registered Building Designer on our team. Our staff members are primarily focused on the planning and permitting phase through ordering, delivery, and service coordination of modular homes, but we cross-train to ensure a fundamental understanding of all phases of modular construction and the building industry. We go to the major building industry trade shows and our staff periodically completes new building code (IBC) review classes.